How would you implement a function that searches for files with a given extension? For example, finding all text files? or *.cpp files? To code that solution you need a way to iterate through directories. Is that possible in C++ out of the box using the standard library? 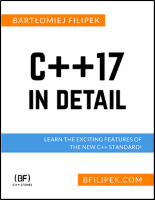 Let’s see some techniques and new elements that C++17 added. How to filter all .txt files from books\ or .cpp files from sources\? The basic idea is to iterate through a directory and then check each entry if it’s a regular file and if it has given extension. And then we’ll move to C++17. Conversion utilities - about from_chars. How To Iterate Through Directories this article! Working with the Path object from std::filesystem - soon! To filter all files with a specific file extension, you’d have to extract the extension from the filename which is just a character array. For a recursive version you can try ftw() - “File Tree Walk” - see documentation here. Still, if you can, you might want to use the native Windows API. The canonical example on this platform uses FindFirstFile, FindNextFile and FindClose (in fact it’s very similar to dirent approach). While iterating you have access to members of WIN32_FIND_DATA which exposes members like path type, filename (CHAR cFileName[MAX_PATH];), access time, file size and more. I hope you have now the basic understanding of how you can iterate through a directory. Yet, it’s not modern C++ and those are mostly low-level system calls. How about something high level? In this section, you’ll see three 3rd party libs that encapsulate old native APIs and expose a much cleaner interface. They are also multiplatform, so the same code will work on Windows and Linux. QT is an extensive framework, so you have separate components to work with the filesystem. For directory iteration, there’s QDirIterator. Only three lines of code! What’s more, you have RAII (there’s no need to close the directory search as it’s encapsulated in QDirIterator). You can get the filename or full file info from the iterator. As you see we have a similar pattern as in QT, an iterator (forward iterator), that allows going through entries. The last lib that I’ll mention is Boost Filesystem, which is a powerful library and well recognised by the community. Here’s the main tutorial if you want to have a quick overview: boost.org: Boost Filesystem tutorial. This time, you can also see an iterator that wraps all the low-level system calls. Each entry has a path that you can access. Please notice that directory_iterator has also support for begin and end so that it can be used in range based for loop. I mentioned Boost because it’s a very well known and heavily used library, and also it was the foundation of the Filesystem TS that was published before C++17… and eventually, the committee merged it into the standard. As you see the interface is much cleaner and more helpful to use than native solutions. In a matter of a few lines of code, you can implement the task. Still, the main drawback is that you have to depend on the whole framework. For example link to all boost libs, or to the entire QT ecosystem. So far you’ve seen several options that allow iterating through files. In all of the cases, you need to rely on the native API or third-party code. But Finally, since 2017 and C++17 you can depend only on the Standard Library! This is possible through std::filesystem which was directly adopted from BOOST filesystem. The iteration order is unspecified, except that each directory entry is visited only once. The special pathnames dot and dot-dot are skipped. The directory_iterator works only inside a single directory, but there’s another class recursive_directory_iterator that allows iterating through the whole tree. You can also implement custom recursion and iterate with a regular iterator in a single directory. Please note that both of the iterators are input iterators, so they won't conform the requirements of parallel algorithms (forward iterators). As for our main task - filtering files by extensions - it’s straightforward! C++17 exposes a path type and you can easily read its extension. just use: path::extension(). on GCC and Clang Remember to add -lstdc++fs to link with the library. In this article, you’ve seen several ways ho to iterate through a directory in C++. Before C++17 you need to rely on some other libraries or system API, but now it’s possible to use std::filesystem::directory_iterator. I haven’t shown the final code that iterates and then filters out the files by their extension. Can you implement it? Or maybe you’d like to share your experience with working with directories in C++. Let me know in comments!